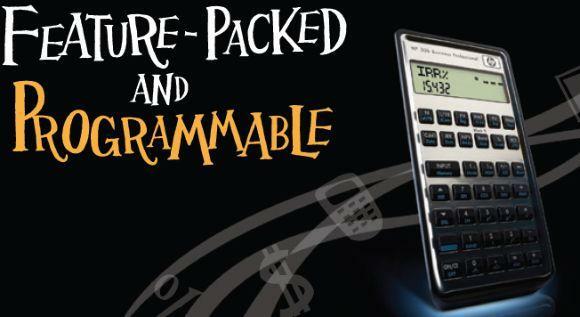 The HP30b Business Professional from Hewlett-Packard is an ideal Financial Calculator for Finance, business, accounting, insurance, real estate, banking and statistics application. 30b Display: 2 line, alphanumeric, adjustable contrast LCD display; First line 8 characters scrolling display + 11 indicators; Second line: 12 +3 digit display. 30b Entry-System Logic: Choice of RPN, hierarchical or chain algebraic. 30b Number Entry: Decimal point selection, 1000 separator selection and fix selection. 30b Menus and Prompts: Detailed real-text labels, menus / worksheets, prompts. 30b Languages: English, French, German, Spanish. 30b Business and Finance Functions: TVM, IRR, MIRR, FMRR, Black Sholes, NPV, NUS, amortization, depreciation, bonds, yield and accrued interest, interest conversion, list-based cashflow analysis, cashflows, break-even analysis. 30b Math and Statistics Functions: List-based, 1 and 2-variable statistics, mean and standard deviation, population deviation, standard error, forecasting, correlations and covariance, +, -, X, / , %, 1 / x, + / - , scientific notation, n!, combinations, permutations, rounding, random numbers, LOG, LN, 10x, Pi, ex, square root, trigonometry, probability. 30b Added Features: Date calculations, display format and language preferences, memory functions, editing (backspace, insert, delete), scroll keys. 30b Internal Precision: 15 digits. 30b Memory: Stores cash flows or statistic data items, plus 10 storage memory registers and user programs. 30b Keyboard: Numeric, HP’s rotate-and-click technology for accuracy and reliability. 30b Power: 2 x CR2032 batteries with power off memory protection. 30b Size and Weight: (L x W x D) 14.92 x 7.70 x 1.6 cm and 115 grams. What’s in the box of a new HP30b: Calculator, batteries, quick start guide, protective pouch and programming overlay.